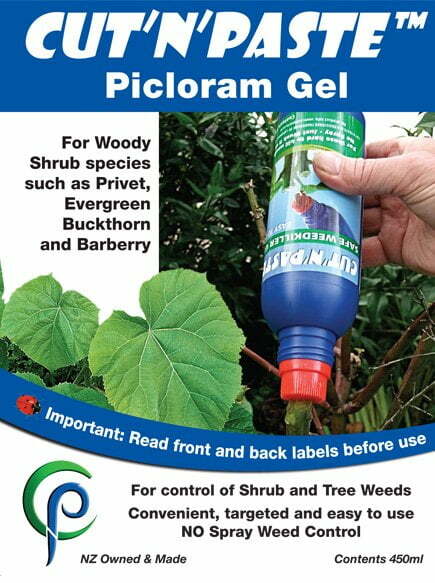 Cut’n’Paste Picloram Weed Gel (43g/L Picloram potassium salt) for woody shrub species, such as privet, evergreen buckthorn and barberry. Cut as close to soil as possible & scrape bark off exposed roots. Liberally paste all exposed wood with a 3mm layer of gel & cut off leafy shoots & paste the cuts. The active ingredient, picloram, is ground residual and can travel through soil, particularly when large numbers of weeds are treated. The mode of action of the pyridine group of herbicides is to disrupt cell growth; some weeds may be resistant to these chemicals. You are advised not to use next to desirable or known sensitive native plants or in areas where their roots might extend into. Do not use if rain is expected with 2 hours. The active ingredient from the gel can leach onto wanted plants. Effectiveness may also be reduced. Do not apply on or around food or animal feed crops or areas to be grazed by animals. In the tightly closed original container in a cool dark place, away from children & pets, foodstuffs, seeds, fertilisers & pesticides. Kept as recommended the gel will show no appreciable deterioration for at least two years from the Date of Manufacture (DOM). 6.5B – May cause an allergic skin reaction. 9.2A – Very toxic to the soil environment. This product must be under the personal control of an approved handler when used by a commercial contractor. Do not use on or near water or carry more than 3kg in a vehicle. MAY CAUSE SENSITISATION FROM PROLONGED SKIN CONTACT. Avoid contact with the skin. Do not eat, drink or smoke while using. Remove protective clothing immediately after handling this product and wash hands and face before meals and after work. Skin contact: Wash with soapy water. Remove & wash any soiled clothing. Ingestion: Do NOT induce vomiting. For advice ring 0800 764 766 National Poisons Centre. Eye Contact: Hold eyelids apart & flush with running water for at least 15 minutes. Seek medical advice if irritation occurs.